You are here: Home / Raw Islam / Raw Islam 51: Can a Muslim Be An All Rounder? 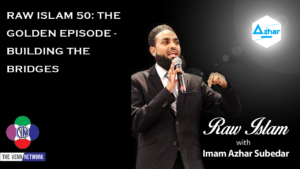 This week on the Raw Islam Podcast with Imam Azhar– a 2017 Podcast Award nominated podcast, our question of the week is can a Muslims be an all-rounder? Imam Azhar opens this episode by teasing episode 52…seems funny that we haven’t even finished this one yet, but whatever… where he will be conducting an interview about the Parliament of World Religions. As an aside, once that episode is published we will put a link here. So, book mark this page and check back next week! Before engaging into the big debate over Sirius/XM vs terrestrial radio, Imam Azhar takes a moment to note the passing of Carl Kasell, who died at the age of 84. He was a broadcaster for NPR for many decades and the judge and scorekeeper for Wait Wait… Don’t Tell Me! Finally, this episode breaks its morbid track when B.C. talks about Harry Anderson’s passion for his work. Imam Azhar goes on to say that there are more than 7 billion people in the world, but as a whole, we are on a sharp decline when it comes to passion. Now how can we correct our course?